● It features 4 filters : A cotton filter, two activated coconut carbon filters and an RO membrane. Filter out sediment particles, rust and so on. PP cotton filter using hot melt multi-nozzle spinning process, to optimize the team members of the particles of water pollution, can cope with more complex water environment. Tap into the water purifier, the first through the non-toxic and tasteless PP cotton filter composed of water pretreatment. Can filter out the sediment in the pipeline rust and other large impurities, the monkey rush travel protection. Remove the large particles in the water, the pre-activated carbon filter began to deal with chemicals in the water, the surface has numerous tiny holes that can absorb water odor, color and residual chlorine from the water, some of the harmful organic matter have been removed. Activated carbon area has 21 large football field! In order to enhance the activity of carbon particles, pre-activated carbon filter with a spring-like design to enhance the raw water odor, residual chlorine and some organic adsorption efficiency to enhance the removal of heavy metal lead. RO reverse osmosis filtration is the key to water purification, purification quality depends on the quality of RO membrane filter and filter technology. 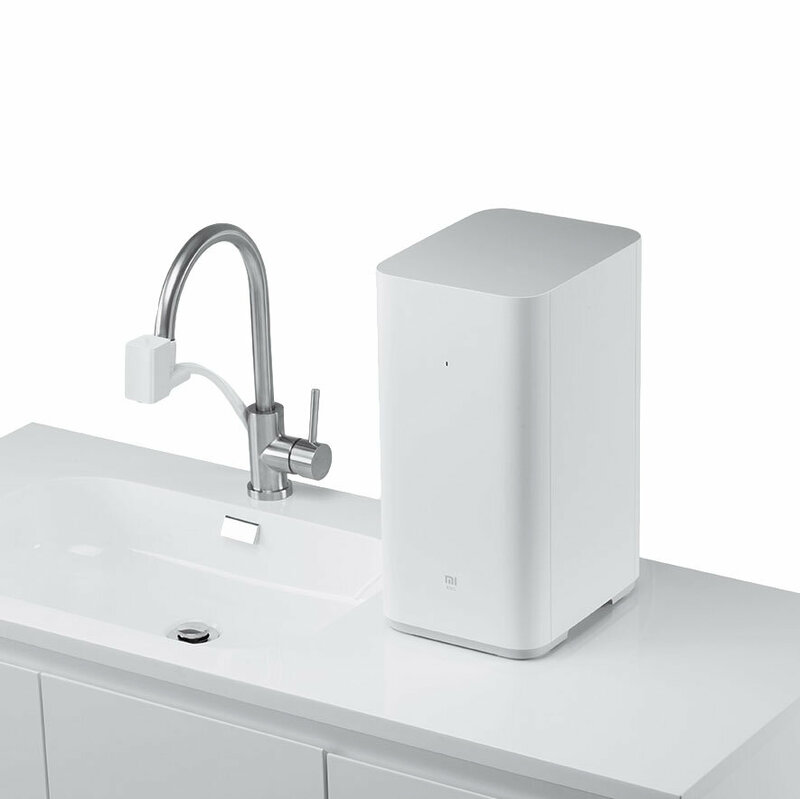 xiaomi water purifier selection of reverse osmosis membrane, worry about purification capacity of 95%. In order to enhance the purification speed and increase the water production capacity, we adopt the mortar reverse osmosis membrane and innovate the water circulation technology to ensure the filtration speed is balanced and stable. The traditional RO reverse osmosis water purifier uses a 50 gallon flow filter, the flow rate of only 0.1L / min, the flow rate is very slow. In order to effectively solve the problem of water flow, we have xiaomi water purifier equipped with 400 gallons of high-flow RO membrane, this film is 4 times the normal, and in order to improve water filtration, the use of multi-page film, the benefits of doing so net There are multiple waterways through the water, greatly improving the filtration effect of pure water. Rear activated carbon filter, with the same level 2 filter imported activated carbon filter, at the same time using the spring design, full cleaning, further purification of residual odor in water and improve the taste, pure water at the entrance, even more sweet and delicious. xiaomi water purifier water quality standards, through the China Center for Disease Control and Prevention xiaomi water purifier water quality testing. Among them, bacteria, heavy metals, inorganic substances such as a number of take-out rate above the standard. Millet water purification through design and structural optimization of more than 90% of innovative components, greatly reducing the millet water purifier covers an area of less than an A4 paper machine size. Small product removed from the box, placed on the table, connect the link power, and link the original tap to use. Traditional reverse osmosis water purifier, the use of water storage tank to solve the problem of water flow, due to the long-term use of bacteria can not be easily cleaned, causing secondary pollution of water, water quality is lower than the health and safety requirements. Traditional water purifier high risk, the need for more than 40 pipe fittings form a waterway system, the more the connection point, the higher the risk of water leakage, in order to reduce the connecting components, through more than 300 design optimization and fluid simulation, and ultimately with a self-developed Instead of a three-dimensional integrated waterway, there is no connection point inside the waterway, but it accommodates 4 layers of 11 cubic waterways in 5 directions. This not only makes full use of every inch of internal space, but also reduces the volume of the water purifier. People because the water purifier installation is too much trouble, not to install, millet water purifier to provide a simple installation. Do not need to change the waterway and lines at home, but also do not need to puncture the original decoration, remove from the box, the water purifier placed on the table, connected to the power supply, and link the original tap can be used. Tap water will inevitably have sediment, rust, wire and other particulate impurities, the more small impurities more likely to cause damage to the water purifier components. Millet water purifier in the key parts before the increase of 13 anti-blocking design, layers of protection to prevent damage caused by fine particles of the machine parts, a comprehensive guarantee system stability, effectively extending the life of water purifier.